Imports of used cars are soaring as dealers and motorists take advantage of cheaper sterling to drive off with a bargain. Figures due to be released by the CSO this week will show that 7,090 imported used cars were registered for the first time in October, a 75pc increase on October, 2015. This brings to 25,016 the number of second-hand car registered in the four months since the end of June, a 62pc increase over the same period last year. It's a different story with new car sales. These were up by a far modest 8pc to 38,554 in the three months from July to September. The October CSO figures will almost certainly show that the divergence between the rate of increase in new and used car registrations has widened even further. Preliminary statistics from the Society of the Irish Motor Industry, which are compiled on a different basis to the CSO's, show a 12pc decrease to 2,243 in new car sales last month. Not alone are sales of imported used cars rising far more quickly than new car sales, the rate at which used car sales is increasing is accelerating. While used car sales were up by 38pc in July, this had risen to 67pc by August and, after a slight deceleration to 64pc in September, by 75pc last month. 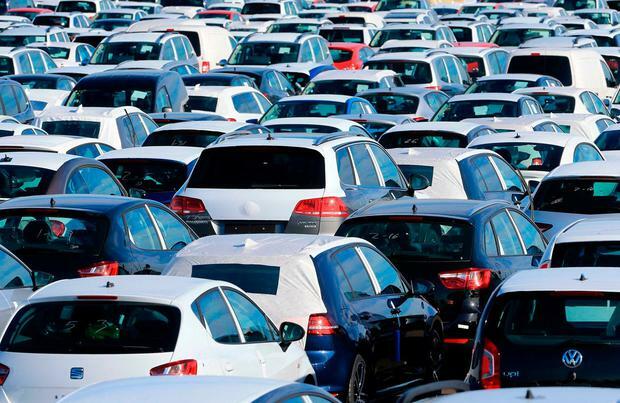 Used imports accounted for just under 40pc of all cars registered for the first time between July and October. So why are sales of new and imported used cars diverging so widely and what are the likely implications? The post-Brexit collapse in the value of sterling is almost certainly the major cause of the tsunami of used imports coming from Northern Ireland and Britain. In the first half of 2016, new cars sales rose by 24pc to 97,490 while sales of imported used cars rose by 25pc to 30,774. In other words, used car sales rose at broadly the same rate as the overall market. Then the world changed on June 23 when the British voted to leave the EU and sterling tanked. The motor trade is one of the sectors of the economy most exposed to a fall in the value of sterling, as a weaker British currency opens up the Irish market to cheaper used car imports from the UK. While cheaper used car imports may be good news for motorists shopping around for a second-hand car, it's a different story if you are a dealer with a forecourt jammed with second-hand stock whose value has plummeted. So what, if any, impact has the weakening of sterling and the enormous increase in used car imports had on the value of Irish-registered second-hand cars? "There has been no blanket change in used car values. Superminis and MPVs are holding up well," says Aidan Timmons who compiles the Used Car Value Guide. "We are still waiting to see the full extent of the impact of the fall in sterling. It could be early next year before we know. You need to look at individual models to see if there has been any cooling off." However, the surge in used car imports will have an impact on the value of Irish-registered used cars. The word from dealers is that the second-hand values of certain high-spec models from the prestige brands have already been hit by used imports. "The weakening of sterling will clearly feed through into used car values in the Republic at some stage", says SIMI deputy director-general Brian Cooke. Motor dealers should be thankful that the sterling collapse occurred late in the year. Michael Noonan's introduction of a second-half registration plate in 2013 notwithstanding, the final six months of the year are a relatively quiet time for the motor trade. As they come up to the New Year, when second-hand values tend to drop in any case, dealers operate a "lean" forecourt keeping their stock of used cars to an absolute minimum. If the sterling collapse had happened towards the start of the year, when dealers traditionally carry far higher levels of stock, things could have been a lot worse. With the exception of VW, whose in-house bank provides finance to purchasers of VW, Audi, Skoda and Seat cars, most of the other motor brands rely on Bank of Ireland for finance. With more than half of all private, i.e. non-fleet new car sales, being financed by personal contract where the future trade-in value is guaranteed, what impact will a fall in second-hand values have on the lender? Of course, as SIMI's Mr Cooke points out, it isn't just individual motorists who have been taking advantage of the fall in sterling to import cheap used cars from the UK. Motor dealers have also been doing so. One legacy of the recession and the collapse in new car sales between 2009 and 2013 is a chronic shortage of three to six-year old Irish-registered cars. This has been fuelling the sharp rise in PCP-funded new cars sales for the past two-and-a-half years. Now, following the collapse of sterling, many dealers are seeking to plug this gap with used imports. This could be bad news for the exchequer. SIMI estimates that new car sales yielded €1.2bn in VRT and VAT revenue in the first nine months of the year. Used car imports, on which no VAT is paid, are far less lucrative for the taxman. Will motorists end up funding any VRT/VAT shortfall through higher fuel and road taxes instead?